“And where did you have lunch?” I asked a visiting chef one time, a talented boy from London known for his quick skill with the butcher knife. “The place around the corner, that white one. Grandma food to the max, I love it!” was his answer. 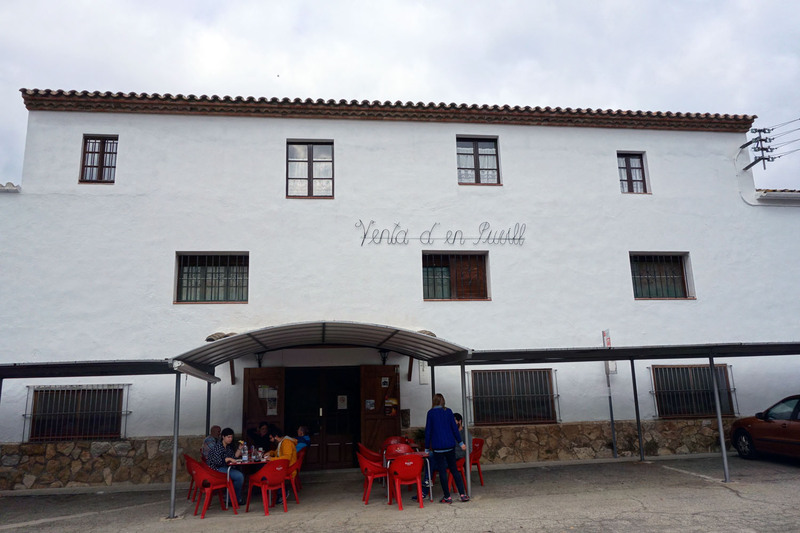 For my first few weeks in the Priorat it was “the white one around the corner” but after a while it became La Venta, the most popular spot to grab lunch between the towns of Poboleda and Cornudella. The parking lot out front is consistently packed with cars and trucks at lunch. It’s not hard to imagine the same space covered with horse carriages a few decades ago. In fact, La Venta d’en Pubill has been around for longer than a few decades. The building itself is a Priorat landmark with a very long and well-documented history. The inn was strategically constructed back in 1806 at the junction T702 where roads leading to Reus and to Lleida intersected those that led to wine. It was built over a main house known as Mas Pubill that had been there since 1762. The inn would provide a place for travelers to park and sleep. Eventually someone thought to open a coffee stand, which gradually morphed into a restaurant in the beginning of the 20th century. 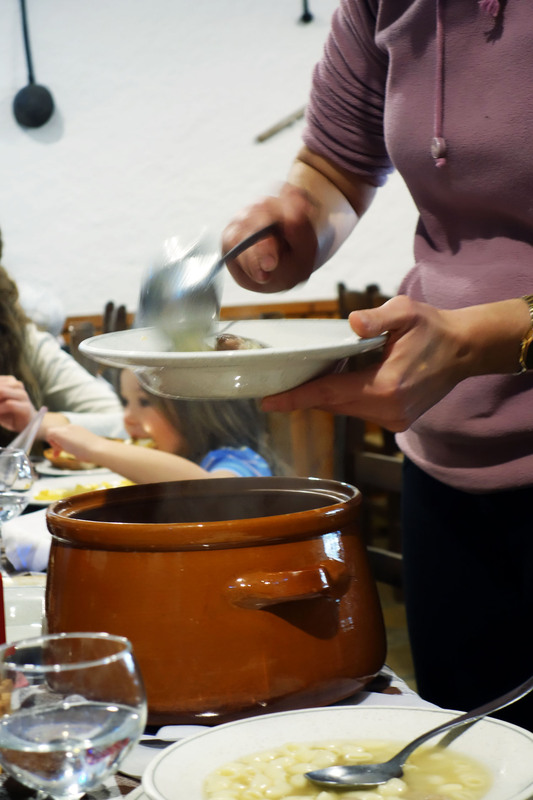 Two sisters named Josefa and Maria Carmen Dolores would come to (wo-)man the kitchen, preparing traditional, homestyle dishes for hungry travelers. And the kitchen is a matriarchal organization if I’ve ever seen one. Picture your grandmother’s kitchen but maybe 2 or 3 times larger, with a team of older ladies pacing about, working on one dish at a time. They’re not calling out tickets, but they have their own system and apparently it’s efficient enough for them to feed three towns without a single table ever having to wait more than 15 minutes for their meal. I’ve never seen them mess up an order and they’ve always been patient enough to stop amidst all the chaos to explain what exactly was samfaina or cansalada or mongetes, back when these words were still foreign to me. Every dish I’ve had at La Venta has been simple and honest and the place has earned my respect as a consequence. 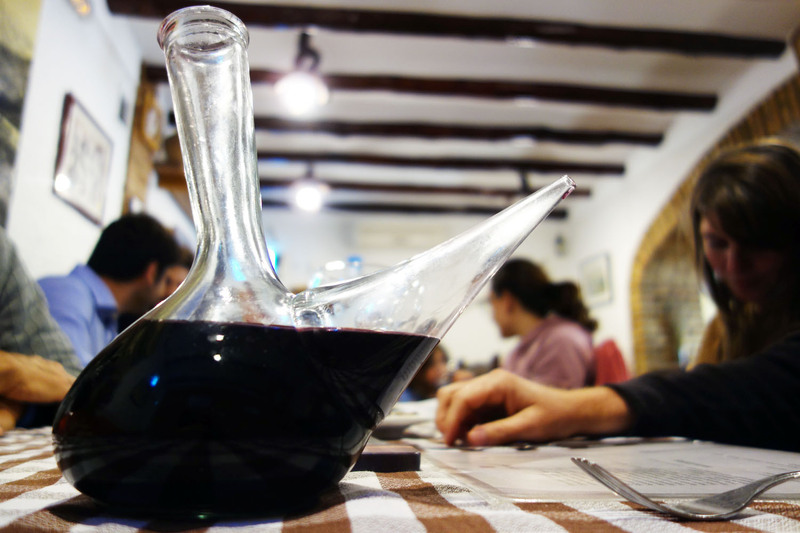 Adorning every checker-clothed table at La Venta is a porró of red wine, a bowl of tiny olives, a basket of bread to dip in oil and a group of grumpy looking middle aged men fresh off the vineyard and ready to eat. When it comes to the wine, folks generally pour from the top, but every once in a while someone will grab the neck and take a long swing, arm fully extended and lips shaped into a perfectly receptive funnel. Porrons are refilled at least once throughout lunch and the audio volume of the chattering patronage grows proportionally to the volume of red consumed. In terms of fresh salads, La Venta doesn’t have too much to offer. It’s more about the samfaina (Catalan ratatouille) and escalivada (ash roasted red peppers and eggplants) that come as a side to charred meats, smoky and rough off the grill. A good one is the bacallà esqueixat (salted cod) salad, which consists of flakes of the fish flesh with a bit of lettuce, tomato and an awkward egg as garnish. The bacalao is as salty as they come but no additional salt is added and it’s drained well so that it tickles the palate just right. The texture is spongy and soft, quite nice to pick at on a hot summer afternoon. 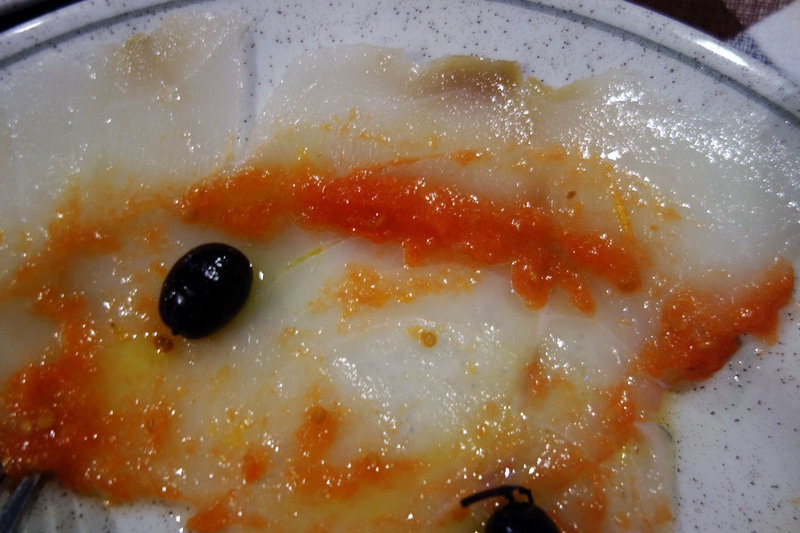 Another presentation of the same salt cod is in a carpaccio de bacalao with some tomato and oil drizzled on. This is actually my favorite way of enjoying bacalo. Thin layers of tender fish are lain over the plate and dressed with the wilted, slightly tired and watery mash of a tomato, seeds and all. The diluted sweetness of the tomato calms the salt of the fish to where the latter becomes more delicate and consequentially more palatable. The oil makes the fish slippery smooth and contributes additional vegetal flavors to the dish without making it greasy. 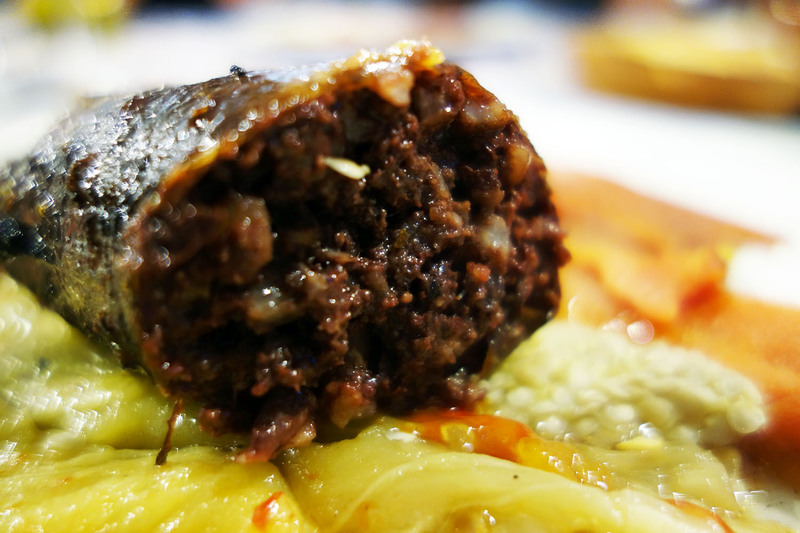 Some days I’m kind of just in the mood for blood sausage and a porró of house red at lunchtime. Whenever I order butifarra negra, the lady always recommends I get the longaniza pork sausage instead and I have to insist. Normally I would take this as some kind of bad sign, but so far I’ve found nothing wrong with the stuff. It’s slightly sweet and herby, with a soft and mushy core and very little rice soaking up all that blood. The casing could be a tad crispier and snap more when sliced into but overall it’s great and, more importantly, available whenever I have a craving for it (which is often). I get it with a side of escalivada (grilled eggplants and peppers) and a few tomatoes that have exploded on the grill. A wonderfully filling, comforting dish altogether, one that makes me yearn for a hammock. 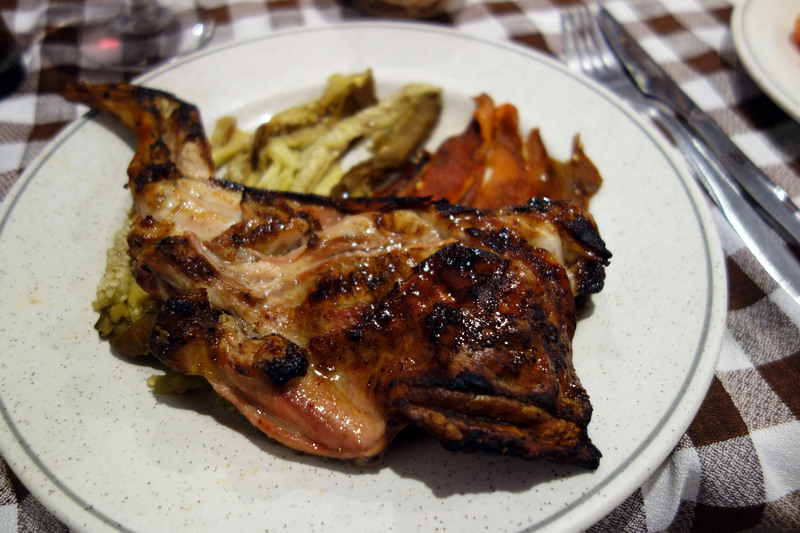 No two orders of grilled rabbit at La Venta are the same. Sometimes it’s the forelegs with a ribcage attached, sometimes hind legs. Sometimes a bit of vertebral column is thrown in as well. 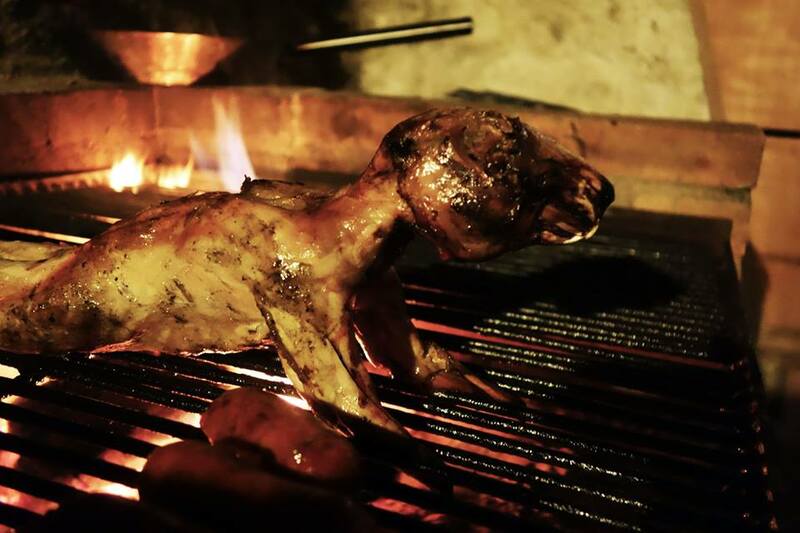 The meat is always cooked to perfection, juicy and soft and more satisfying than what you’d expect from such a dainty little creature. The flavor of the grill sticks, smoke licking the otherwise naturally sweet, delicate flesh. There’s not an excess of oil to make the meat greasy and the oil used is the cheap but relatively good olive oil from the region. It’s a simple, hearty meal that goes best with a siesta or a coffee and a cigarette out front in the parking lot. 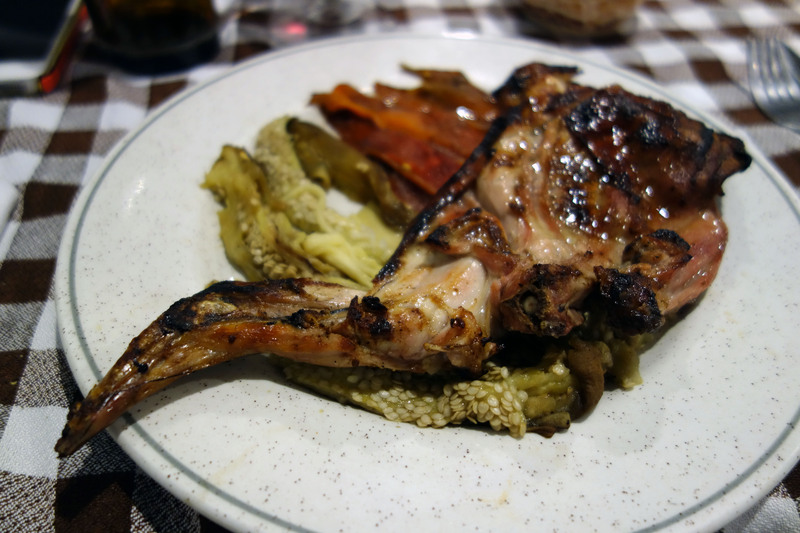 I think in the Priorat I’ve eaten more rabbits per week than I have combined in my life. I’ve seen them caught. I’ve seen them stretched out with the head and innards left in at the poultry section of markets. I’ve seen them bearing their ghastly incisors in vain, sweating their essence onto a red hot grill. And after just over three months it hasn’t gotten old. It’s just replaced chicken as a meat I appreciate more. Brunch is big in Priorat. Beer and wine porrons replace mimosas and bloody mary pitchers. Hardly anyone drinks coffee. Salty bacalao replaces lox. There’s plenty of hearty hangover cures on the menu and egg reigns supreme. There are no crab cakes or leafy green salads but you can get a whole rabbit at 10 a.m., so that’s pretty special. The restaurant is packed with hungry travelers, local families and the occasional group of surly middle aged men escaping from nagging wives back home. The longest section of the menu is dedicated to various open faced llesques, with all kinds of toppings lain over. The most popular item by a large margin is longaniza sausage with fried beans and escalivada as a side. But I’d had longaniza far too many times to waste my first ever Venta breakfast order on the densely packed and not too flavorful tube of pork. So I went with one of the less common mains. 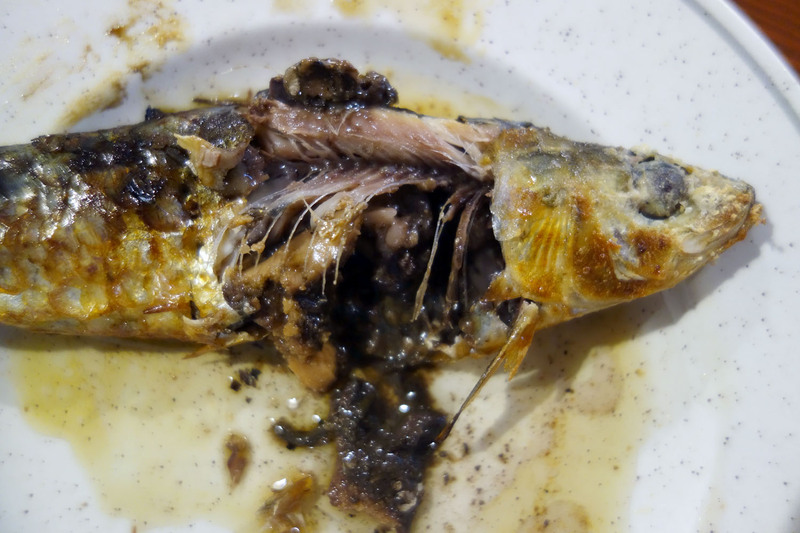 It’s called arengada, which the menu translates as “fried herring” but which I believe is actually an overgrown sardine, in all of its salty, briny, dirty, murky glory. 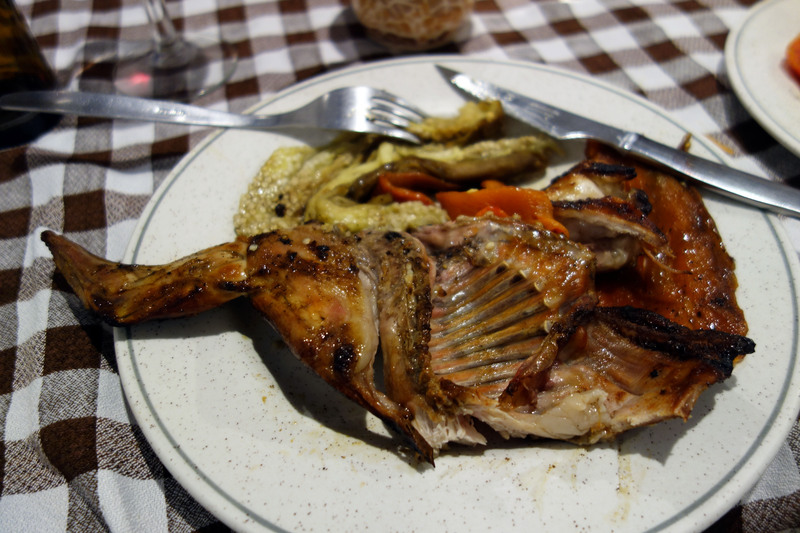 As I sliced open the tender belly of the fish, it vomited dark brown innards violently onto the plate. Usually innards get me pretty excited, but this stuff gave me a hard time. Imagine an entire jar of anchovy fillets ground down to a chunky pulp and then served with absolutely nothing to mask or dilute its flavor. And it wasn’t like the meat was any different. Just as salty with fibers that hardened in the heat, invisible bones ready to stab at ya in retaliation. Sure I filleted it wrong. 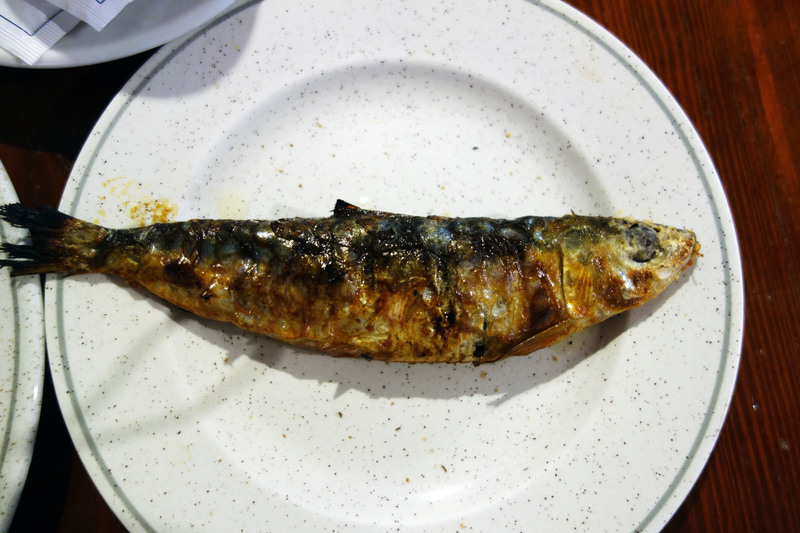 And yeah, I supposed I could’ve asked for a slice of toast to smear with a thick layer of sweet butter to layer the aggressive little fish flesh onto. But it was a lazy Sunday morning following a friend’s late night birthday party and I wasn’t up for DIY activities. 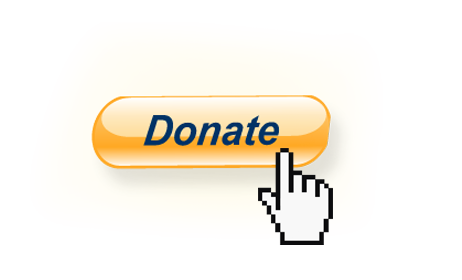 Pass on this one. 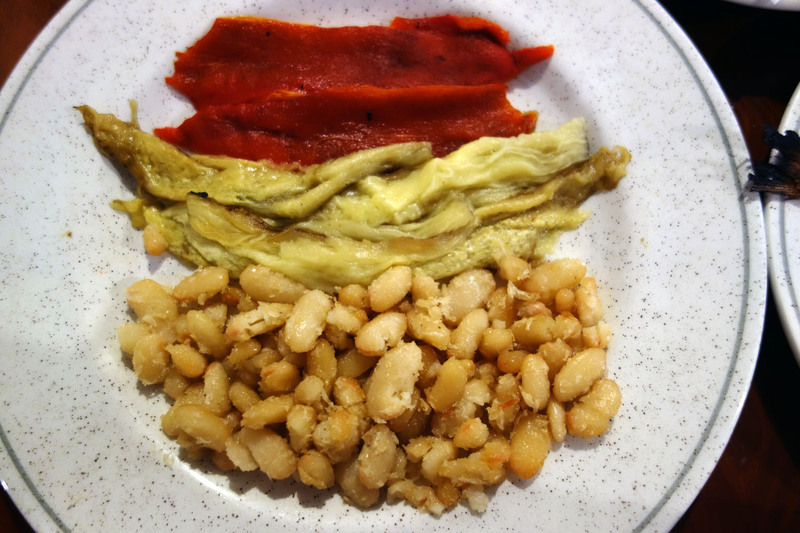 The escalivada (after adding oil and salt) was as comforting as usual and the fried beans were honest and wonderful. The skins got crispy before breaking into a soft, sandy texture I’ve never encountered in a bean. I could’ve done with a big bowl of these with – I hate to admit – a juicy hunk of sausage. Next time, maybe. My dining companions went with more conservative egg dishes, an eggy tart with melted cheese and a fluffy omelet with the same white beans mixed into the batter. The gals both offered me pieces that ended up saving me from the onset of post-inebriation starvation, which an inedibly salty piece of fish was not doing a great job at fending off. 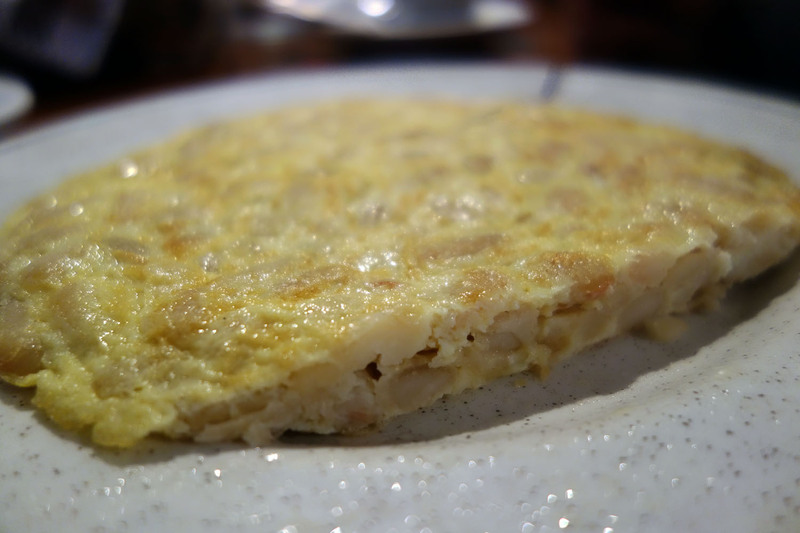 I particularly enjoyed the white bean omelet for its simplicity and for the fact that it wasn’t screwed up in any way. The right amount of good oil was used to cook it. The thickness of the omelet was just enough to allow white beans to peep through and caramelize upon contact with the pan. And, most importantly, it wasn’t over-salted. 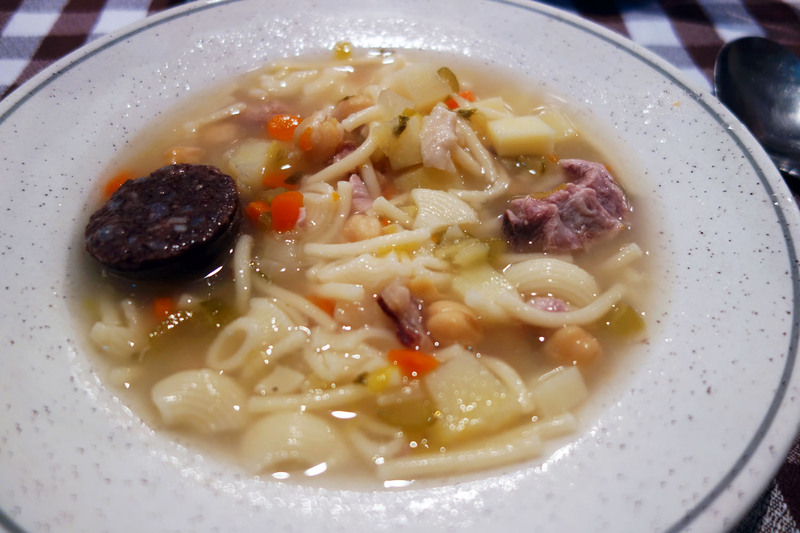 In no dish is the grandma love that makes La Venta such an institution more pronounced than in the escudella, a rustic one-pot soup of potatoes, carrots, celery, garbanzos (cigrons), thin noodles, pasta shells (galets), rice, sausage and meat parts. 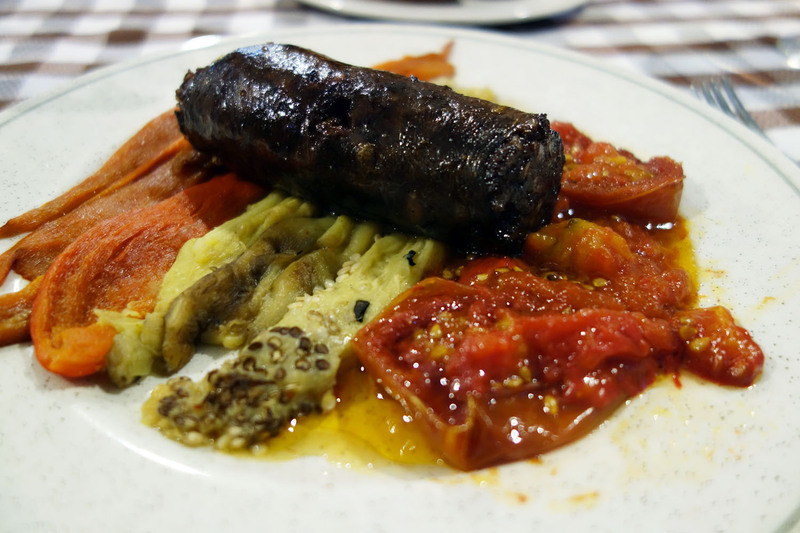 It has the feel of a Catalan national dish with a million different variations depending on family customs. Simpler versions are prepared all year round, though the real deal (with meatballs and all) is reserved for Christmas Eve. There are crumbly, soft rounds of butifarra negra, pork parts and chicken parts both fatty and lean. Bones, cartilage and collagen thicken the soup with gelatin, giving the broth and unctuous, rounded mouth feel. I came across tender breast but also a neck, some lungs and pieces I could not identify. I sucked creamy marrow out of a thin bone. 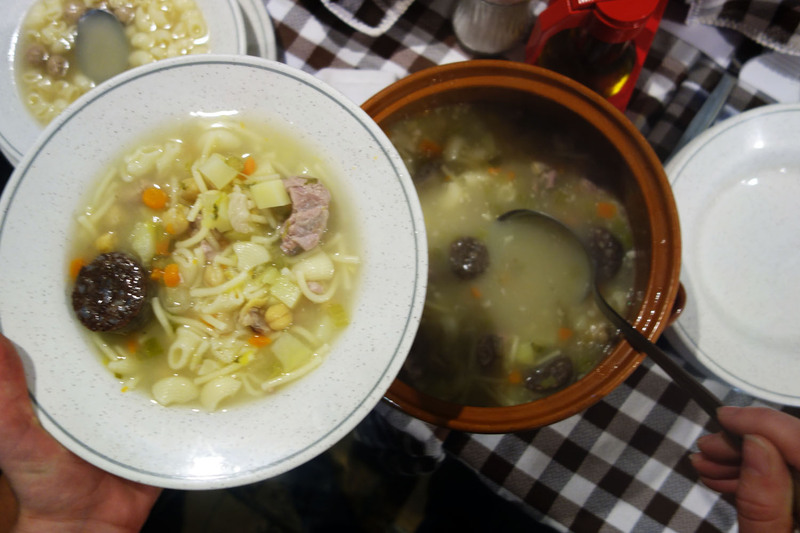 My little adventure through this dish put me back into the kitchen of my grandmother, where I’d patiently spoon the bowl of meat soup she would set before me. The latter would have neck and hearts, gizzards and feet suspended in a rich broth so dense with flavor coaxed patiently out of simmering meat and vegetables. The escudella too radiated that grandma touch, that warmth and comfort, that feeling of coming home and slipping on a pair of fuzzy moccasins, of being cared for unconditionally. When ordering the soup, the lady asks “For how many?” and when we tell her five she brings out an entire pot, carrying it across the dining room with two towels wrapped under the handle just like my grandma would lift a pot fresh off the stove to put in the center of the table. She even makes a move to ladle it into our plates herself but (for a reason I still can’t understand) my dining companions tell her not to worry about it. Everything about the experience is cozy and familiar. The hot soup warms you inside and out on a cold November day. After many meals at La Venta it’s become quite obvious that it’s exactly this love and feeling of being cared for that draws the local regulars back daily and it’s what drew me back too. Some dishes are consistently wonderful and others I never got used to, but there was always a sense of honesty simplicity and modest pride that made both the food and the restaurant very inviting. November 6, 2014 in THE PRIORAT.